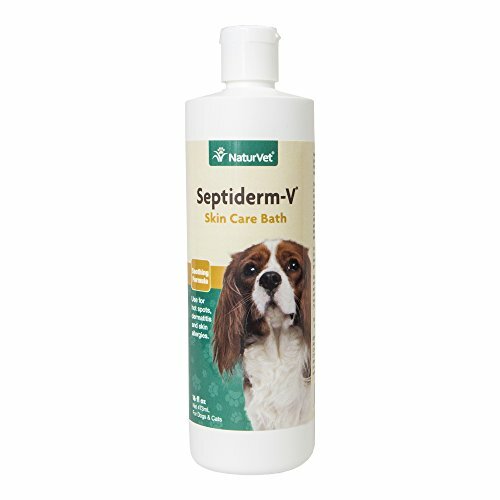 NaturVet Septiderm-V Skin Care Bath Helps Soothes and Relieves Itching that may be Caused by Hot Spots, Flea Bites, Dermatitis, Rashes and Skin Allergies. Effective Deodorant Shampoo and Excellent Grooming Aid. Provides Cleansing Action and Removes Dirt without Stripping Natural Oils, Rinses Easily and Helps to Control Static Electricity (“fly-away”) Coat. Regular Bathing, Plus use of NaturVet Septiderm-V Skin Care Lotion on all Areas Where there is Inflammation, Hair Loss or Sores Evident, will Provide Relief from the Intense Itching of a Bacterial Skin Infection. Liquid 16oz for External Use Only on Dogs and Cats Over the Age of Six Weeks. Shake Well Before Each Use. Wet Animal Thoroughly and Apply Sufficient Amount to Lather Well (Can Apply Straight from Bottle or Dilute with One or Two Parts Water, Depending on Length and Density of Coat). Massage in Well, Allow Ten Minutes Contact Time and Rinse Completely. Repeat Bathing Semi-weekly or Weekly and Apply NaturVet Septiderm-V Skin Care Lotion to Hot Spots or Sores Daily According to Directions until Conditions are Under Control. 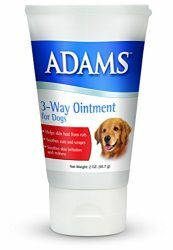 For Routine and Grooming use: Apply as Directed Above Except Contact Time May be Shortened, Bathe Monthly or as Needed. All NaturVet Products are Veterinarian Formulated and Manufactured in the USA in an FDA Audited, cGMP Compliant Facility with a 100% Satisfaction Guarantee.Soothing formula helps to relieve itching due to skin problems caused by hot spots, flea bites, dermatitis, rashes and skin allergies. Regular bathing, plus the use of NaturVet Septiderm-V Skin Care Lotion on all areas where there is inflammation, hair loss or sores will provide relief from intense itching. Provides thorough cleansing action and removes dirt without stripping natural oils. Rinses easily and helps to control static electricity (“fly-away”) coat. Effective deodorant shampoo and excellent routine grooming aid. Liquid 16oz for external use only on Dogs and Cats over the age of six weeks. Shake well before each use. Wet animal thoroughly and apply sufficient amount to lather well (can apply straight from bottle or dilute with one or two parts water, depending on length and density of coat). Massage in well, allow ten minutes contact time and rinse completely. Repeat bathing semi-weekly or weekly, and apply NaturVet Septiderm-V Skin Care Lotion to hot spots or sores daily according to directions until conditions are under control. For routine and grooming use: Apply as directed above except contact time may be shortened. Bathe monthly or as needed.